IN “The Fear of Full Employment” (NL, October 31, ’88) we examined some of the fallacies behind the almost universally held doctrine that full employment makes for high inflation. This time we’ll look at another almost universally held doctrine, namely that raising the interest rate is the cure for whatever inflation exists. An astonishing thing about the latter doctrine is that no one bothers to say why it should work. The New York Times, which never mentions the prime interest rate without pedantically explaining that it is the rate banks charge their most credit-worthy borrowers, regularly reports without question that if the Consumer Price Index (CPI) starts to rise, the Federal Reserve Board will have to raise the interest rate. Economists divide what they call the nominal or “money” interest rate (which is what you pay) into two parts: “real” interest (what they think you’d pay if the economy were in equilibrium) and an allowance for inflation. The allowance for inflation is what in other sectors of the economy is called a Cost of Living Adjustment, or COLA. People with money to spare are said to be enticed into lending by the prospect of getting back their money at a stated time with stated interest. What they want back is not the money, but the money’s purchasing power; and in inflationary times the only way to get back the same purchasing power is to get back more money. Hence the Bankers’ COLA. Of course, bankers don’t call it a COLA. They have, in fact, been unremitting in propagandizing the notion that COLAS are bad and greedy and inflationary and likely to cause the downfall of the Republic. 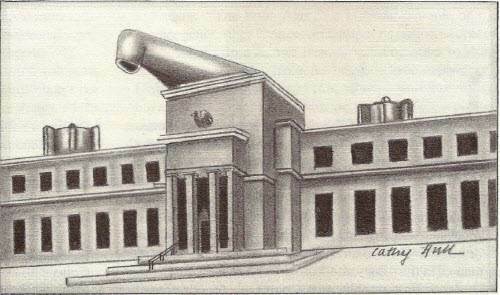 The COLAS bankers talk about are those that appear (or used to) in labor contracts, where they are manifestly an increased cost of doing business for companies with such contracts, and those that appear in Social Security and other pension payments, where they are manifestly an increased cost of running the government. (Another COLA, seldom mentioned, is the indexing of the income tax.) Since increased costs of doing business increase prices, and increased costs of running the government increase taxes (or the deficit), it is argued with some reason that COLAS are inflationary. The propaganda against them (coupled with high unemployment and underemployment) has pretty well knocked cost-of-living clauses out of labor contracts. The Social Security COLAS are somewhat more secure because there are more worried senior citizens than alert union members. Even so, the steady cacophony from Peter Peterson and other investment bankers (when they take time off from promoting leveraged buyouts, which they evidently don’t think inflationary) has put the American Association of Retired Persons on the defensive. 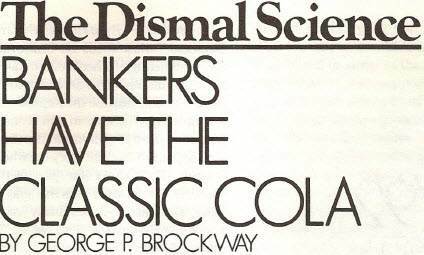 The Bankers’ COLA, however, is accepted as a natural law and discussed matter-of-factly in the textbooks, while the others are deplored as the work of greedy special interests out to line their own pockets at the expense of the nation and its God-fearing citizens. One way of stating the Banker’s COLA is that it is the difference between the interest rate now and that of some earlier, less inflationary time. The prime rate at the moment is 10.5 per cent, and may have gone higher by the time this appears. In the 4O-oddyears since the end of WorId War II, there is one stretch, from 1959 through 1965, when the CPI and the prime were both substantially stable. In those seven years the CPI varied from 0.8 per cent to 1.7 per cent, and the prime from 4.48 per cent to 4.82 per cent. (Readers with a political turn of mind will note that the Presidents in this period were a Republican and two Democrats- Dwight D. Eisenhower, John F. Kennedy and Lyndon B. Johnson.). The Bankers’ COLA was evidently no more than 1.7 in those years, and the “real” interest rate was somewhere between 3.5 per cent and 4.5 per cent. Let’s accept the higher figure, even though it is substantially higher than, for example, the rate in the years when the foundations of the modern economy were laid. Subtracting 4.5 per cent “real” interest from the current prime, we determine that the current Bankers’ COLA is, conservatively, 6 per cent. But only about a tenth of outstanding loans were written in the past year, and many go back 25-30 years. Over the past 10 years the CPI has increased an average of 6.01 per cent a year. That is remarkably (and coincidentally) close to our estimate of the current Bankers’ COLA. The average gets higher as we go back 15 and 20 years, and falls slightly if we go back 25 years. Consequently if the Bankers’ COLA has been doing what it’s supposed to do, we are not overstating the case in saying that today it is running at about 6 per cent. Now, the present outstanding debt of domestic non-financial sectors is about $8,300 billion. This figure includes everything from the Federal debt to the charge you got hit with when you didn’t pay your bank’s credit card on time; excluded are the debts banks owe each other and, for some reason, charges on your nonbank credit card. The cost of the Bankers’ COLA for this year therefore comes to about $498 billion (6 per cent of $8,300 billion). 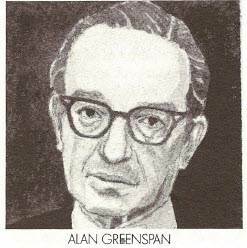 As the late Senator Everett McKinley Dirksen would have said, we’re talking about real money. Let’s try to put it in perspective. At the moment the CPI is said to be about 4.5 per cent (less, you will have noticed, than the Bankers’ COLA, because bankers expect inflation to get worse). Since the GNP is currently about $4,500 billion, inflation is currently costing us 4.5 per cent of that, or $202.5 billion. The Bankers’ COLA is thus costing us almost two and a half times as much as the inflation it is claimed to offset. So we come to Brockway’s Law No. 1: Given the fact that outstanding indebtedness is greater than GNP (as is always the case, in good years and bad), the Bankers’ COLA costs more than the total cost of inflation, at whatever rate. SINCE THE Bankers’ COLA costs the economy more than inflation does, without it there would in effect be no inflation. Other things being equal, there would actually be deflation. And of course very great changes would follow if so large a factor as the Bankers’ COLA were eliminated. Reducing the interest rate to its “real” level would quickly and powerfully stimulate investment in productive enterprise, with a consequent growth in employment. It would trigger a one-time surge in the stock and bond markets, followed by a gradual tapering off of speculation. As matters stand now, the Bankers’ COLA is an incubus of terrible weight depressing the economy. That this is so is revealed by the statistics whose subject is people rather than things. The standard of living of the median family is falling, even with two earners per family much more common than formerly. The number of people living in poverty is growing, and within that group the number of those who work full time yet are poverty stricken is growing still faster. The rate of unemployment – even counting part-timers as fully employed, and not counting at all those too discouraged to keep looking for work – would have been shocking a few years ago. These are signs of recession, of bad times. The interest cost is the only one that has a general effect on the economy. We used to hear a lot about the wage price spiral, but a wage increase in the automobile industry (for many years the pundits’ whipping boy) works its way through the economy slowly and uncertainly. Initially it affects only the price of automobiles, and it never brings about a uniform wage scale. Wages of grocery clerks remain low, and all wages in Mississippi remain low. A boost in the prime rate of a prominent bank, on the other hand, immediately affects the rates charged by every bank in the country; and while it is possible for borrowers to shop around a bit for a loan, they find that rates vary within a very narrow range. More important, interest costs affect all prices, because all businesses must have money, even if they don’t have to borrow it, and the cost of money is interest. Vastly more important, the Bankers’ COLA is a forecast, a prediction, a prophecy. The figures we have been working with are from the past, but bankers – including, especially, those who make up the Federal Reserve Board – set rates that will have to be paid decades into the future. Well into the 21st century, for instance, we will be paying up to 15.75 per cent interest on a trillion dollars’ worth of Treasury bonds sold in the wonder-working days of former Fed Chairman Paul A. Volcker. 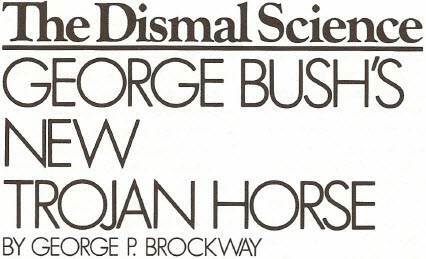 So we come to Brockway’s Law No. 2: Raising the interest rate doesn’t cure inflation; it causes it. Editor’s Note: For those who are too young or forget the Coca Cola company came out with the “New Coke” in 1985, and it bombed. Under-duress they kept the New Coke on the market, for a while, and re-issued the product people wanted to buy as Coca-Cola Classic, or the “Classic Cola.” http://en.wikipedia.org/wiki/Coca_Cola_Classic. Thus the gentle wit of the title of this article. I SEE BY the papers that many a pundit, from the President on down, thinks the dollar should fall a bit more-but not too much more. How much is too much? Two answers are given: (1) We don’t want to scare foreign investors into pulling their marks .and yen out of our economy, and/or (2) we don’t want to do anything to start inflation again. Quick rejoinders are: (1) There are dollars but no marks and yen in our economy, and (2) no one who has had occasion to buy anything thinks inflation has ever stopped. Let’s take a look at the problem in a little more detail. 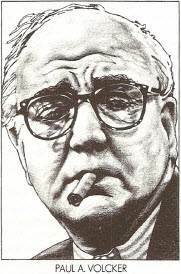 Those foreign investors were a big concern of former Federal Reserve Board Chairman Paul A. Volcker (see “Vale, Volcker,” NL, June 1-15, 1987). The story was that we needed them to finance the budget deficit because, as pundits keep telling us, we don’t save enough to finance it ourselves. And the foreigners, being strangers in a strange land, had to be offered bait in the form of high interest rates. It is possible to argue that our maneuver was self-defeating, since the annual interest on the Federal debt is now close to double the annual deficit. Yet mistake or not, the bonds have been sold, some with coupons as high as 15.75 per cent, and there is nothing that can be done about it; so we should (as the President plaintively pleads about a great many things) put it behind us. At this point we are supposed to worry that foreigners will pull out if the dollar falls much lower, and it is certainly understandable that the Great Crash of 1987 may have made them skittish. Getting their money out could, however, be a bit more complicated than it appears. Say Mr. Togo has some of those nice 15.75 per cent 20-year bonds (payable November 15, 2001) and so does Ms. Falck, and they want to sell them. No problem. The quote this morning is 153 bid, 153 6/32 asked. Although the price may shift a bit one way or the other by the time our foreign friends contact a bank or a broker, they can be confident of selling the bonds at 153, give or take a few cents. Cents? Well, yes, and naturally the 153 is dollars. They’ll get $15,300 for each $10,000 bond they own – a nice capital gain on top of the 15.75 per cent interest they’ve been receiving since purchasing the bonds in 1981. But Mr. Togo and Ms. Falck don’t want dollars and cents. The whole idea is to pull their money out of the United States, because the financial tipsters they read tell them Washington isn’t going to put its house in order (whatever that means). They want good old yen and marks, respectively. Again, no problem. This morning the yen is quoted at 127.90 to the dollar, and the West German mark at 1.6805 to the dollar. There may be a slight fluctuation before the exchange is made; still, Mr. Togo and Ms. Falck will have their familiar currency back. Now, when Mr. Togo and Ms. Falck are given yen and marks for their dollars, it is because someone buys their dollars for yen and marks. Obviously. But look you: The numbers of dollars, yen and marks remain the same (this is one place where money has a quantity). Mr. Togo and Ms. Falck can get their money out only if some other foreigners put theirs in. Should all foreigners try to get their money out simultaneously, the exchange rate of the dollar would surely fall, and fall very fast (this is the one place where the law of supply and demand works). It wouldn’t be a free fall. At some stage Mr. Togo’s compatriots would get so few yen for their dollars that, say, $40 million wouldn’t be worth much to them, and they might just as well use it to buy a painting of flowers that van Gogh never got around to finishing. Or Ms. Falck’s compatriots might think it smart to buy an American publishing house or two with their cheap dollars. In the end, the only way all foreigners can get their money out of the States is by buying something we have to sell. Of course, this is how they got the dollars in the first place: We bought some of what they had to sell. It is also well to remember that, budget deficit and all, ours is a pretty stable society and therefore not altogether a bad place to keep your money. 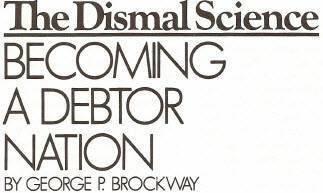 Moreover, our debts are denominated in dollars (except for some worrisome ventures of our biggest borrowers), which distinguishes us from Third World debtors (see “Becoming a Debtor Nation,” NL, February 24, 1986). The pressure is not all one-sided. We’re eager to buy Hondas and BMW’ s, and they’re eager to buy American securities, both public and private. They may not be so eager to buy more securities if the Federal Reserve lets the dollar continue to fall, but they’ll have to buy something we have to sell-unless they intend to give us Hondas and BMW’s for free. They may buy goods we produce, and that will certainly be fine with us. On the other hand, they may buy or build factories to make a Stateside version of the Honda. Or they may put their excess dollars into real estate. Large chunks of our major cities are already Japanese owned, just as large chunks of London are Arab owned (and substantial pieces of Manhattan are British and Canadian owned). Patriotic sentiment aside, should we be upset by foreign investment in American industry and real estate? From the standpoint of American working men and women, it makes no difference who their employers are (unless they’re self-employed) so long as the employers are fair and decent. From the standpoint of American consumers, it makes no difference who produces the merchandise they buy so long as the quality is good and the price is fair. From the standpoint of American investors- well, they’ve shown themselves more interested in speculating on the stock market, anyhow. From the standpoint of the American government, taxes on foreign-owned income could be as good as taxes on domestic-owned income (I say “could be” because the Administration has wimpishly restored breaks for foreigners that we’ve canceled for ourselves). There remains the problem of the profits earned by these foreign-owned factories and buildings. Our payments to foreigners are already in the tens of billions of dollars annually. If they go even higher, won’t they drain the lifeblood out of the economy? Hardly. These profits are in dollars and thus only exacerbate the foreigners’ difficulty in converting dollars to yen or marks or whatever. The profits will have to be spent on American goods or invested in American industries or exchanged for yen or marks at increasingly unattractive rates. BECAUSE DOLLARS will mean so little to them, our Japanese and German friends will be increasingly able to outbid us for paintings and publishing houses and such that come on the market. That will be a blessing for those of us who have things for sale, but it brings us to the second problem of the falling dollar-inflation. Conventionally, this is seen to result from the rising dollar cost of imports. The effects are both direct and indirect. Directly, to the extent that the price of a Mercedes is a factor in the Consumer Price Index, an increase in the number of dollars it takes to buy a Mercedes tends to increase the CPI. Indirectly, if it becomes necessary to put up $85,000 worth of marks to import a Mercedes, General Motors might feel safe in bumping the price of a Seville to $75,000. There is little in the history of General Motors to suggest a reluctance to do the bumping, nor can I think of any likely reason for them to hang back. Potentially more serious are increases in the costs of raw materials, principally oil. The effect here is somewhat mitigated by the fact that OPEC quotes its prices in dollars. It is also mitigated by the fact that sluggish economies around the world have made oil a glut on the market. It could be further mitigated, if not eliminated, by the pursuit of rational conservation policies-but that’s probably too much to expect us to undertake. The inflationary effect I call your attention to is the bidding up of the prices of American industries. That happens when companies are bought outright and also when shares are bought on the exchanges. 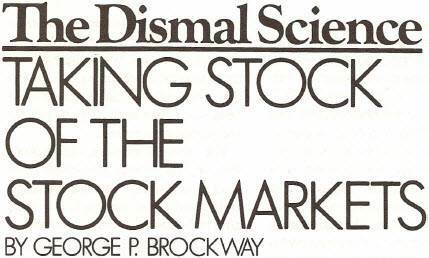 The Great Crash of 1987 is one sort of consequence. A much more dangerous consequence is the compulsive reaction of American managements to increased valuation of their companies. They feel obligated-and indeed are obligated by their investment bankers- to try to raise profits to match the increased valuations. They can do this in two ways, neither of them desirable -by raising prices, which is inflationary, and by holding down wages, which is stagnatory. 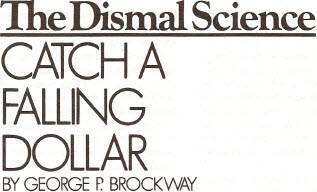 In the space remaining I can only suggest that the conventional solution of protecting the dollar by raising interest rates is precisely wrong-headed: It is merely another prescription for stagflation. The hopeful solution would combine a monetary policy of low interest rates (that would tend to encourage industry) with a fiscal policy of steeply progressive taxation (that would tend to discourage speculation by foreigners as well as by Americans). If such a solution incidentally soaked the rich, it’s about time, for it must be acknowledged that they have not performed faithfully as stewards of the inordinate share of the common wealth they have engrossed over the past 15 years, and especially over the past seven. Their wanton misuse of their increased riches mainly to create a bull market and a crash was, and is, a passionless prodigality. As far as the editor can determine the names Togo and Falck are intended to represent generic Japanese and German investors and do not refer to actual individuals. AT SOME POINT recently, the United States crossed a great divide. Rather, we re-crossed the divide and became again a debtor nation, as we were until 70 years ago, owing more to the rest of the world than the rest of the world owes us. We owe so much, as a matter of fact, and our debts are piling up so fast, that very shortly we may become the world’s largest debtor, surpassing Brazil, the present leader. Mention of South America’s biggest country causes our hearts to miss a beat. Only a decade ago our financial wise men were ecstatic about the Brazilian GNP and jostled each other in their eagerness to press our savings on the Brazilian government, on Brazilian entrepreneurs and on conspicuous Brazilian consumers. There’s no need to detail what happened. Will the same thing happen to us? Our hearts must miss another beat when we reflect on the British, our creditor until World War I and an overall creditor for another decade. But in World War II they crossed the divide from general creditor to general debtor, and coincidentally entered upon a downward slide whose end is not yet. Does a similar fate await us? Foreign debts-like national or even personal debts-come about in different ways that can have different effects. Since, as I never tire of saying, economics is not a natural science, the effects are not invariant nor, especially, are they invariably benign (or malign). The most obvious source of foreign indebtedness is an unfavorable trade balance on current account. This means, merely, that we buy abroad more than we sell there. As a result, we increase our stock of capital goods (machine tools, for example, or knitting machines) and our supply or flow of consumer goods (automobiles or sports shirts). That is good, for it increases our common wealth and has a moderating effect on our inflation. Whatever its impact, an unfavorable balance on current account can continue as long as foreign sellers are willing to extend us credit. Of course, we must also be willing to buy. In both cases, the willingness is reinforced by (or is a sign of) the “strength” of the dollar. Our currency is strong (that is, attractive to foreigners) because our interest rates are high and our society is large, open and comparatively stable. Thanks to our size, there are a lot of dollars around, and practically all of our foreign sales and purchases and borrowings are in terms of dollars. Therefore, we are the masters of our fate; we (well, the Federal Reserve Board) set the terms of our trade. Of course, the dollar can lose its strength, too. Indeed, we had a weak dollar not that long ago. This weakness was not of a piece with President Carter‘s alleged wimpishness; it was deliberately induced by President Nixon‘s alleged machismo. A weaker dollar means lower purchases and higher sales abroad, with both consequences producing higher employment and, probably, higher prices at home. No one really knows the extent of the consequences, but they can be handled, for there is very little we absolutely have to buy abroad: bauxite and a few such things that we don’t have, oil and a few such things that we’re too self-indulgent to manage properly, coffee and a few such things that are enjoyable yet hardly necessary. In short, since our national existence is far from dependent on foreign trade, we are not threatened by that part of our foreign indebtedness that is caused by the imbalance on current account. The next most visible category of our foreign indebtedness consists of foreign purchases of U.S. government bonds (part of the capital account). Federal Reserve Board Chairman Paul A. Volcker considers he purchases important perhaps vital-in financing the Federal deficit. Without them, he argues, much less money would be available and the interest on government bonds would be much higher than it is. Moreover, the government would crowd private industry out of the money market. Businesses unable to afford the high rates would fail; even successful businesses would have to reduce operations-in other words, fire people. The quantity of money, however, is controlled by the Fed itself (at least the Fed thinks it is), making you wonder who is doing what to whom, and why. In any case, we seem to have some sort of reason to be grateful for foreign purchases of our bonds. It’s pleasant to see that money coming in, but then the interest money has to go out, and the rate has to be high to induce people to buy the bonds. What do foreigners do with the dollars we pay them? Well, the dollars can be used to buy American goods, whereupon our prices will tend to rise, the dollar will tend to strengthen, and we will have to sell them less for their money. Alternatively, they can use the dollars to buy their own currencies, whereupon the dollar will tend to fall, and we will be able to sell more goods abroad and to import less. Now, that is very curious: The results are contradictory, yet both are largely favorable. There are two explanations, and I can only hint at them in this space. The first and more obvious one is that very few, if any, economic policies are all good or all bad-an unexampled blessing-and we are here accentuating the positive. The second and more important explanation is that our economy- faulty as it surely is-is more liberal than most of those of the rest of the world. That is to say, in the United States whatever is to the benefit of one class is likely to have some benefit for everybody. It is more nearly true that whatever is good for General Motors is good for America, I am suggesting, than that ours is a zero-sum economy. All workers are consumers and so benefit from low prices, and most consumers are workers and so benefit from high wages. If more American consumers had good jobs it would be better for all of us. The third most visible category of our foreign debt involves investment in U.S. industries. Foreigners have played our stock exchanges and commodities markets for years. Major chunks of U.S. real estate-New York’s Pan Am building, for example-are foreign owned. Volkswagen had a U.S. assembly plant decades before Toyota and General Motors settled on their new joint venture. Foreign ownership has gone so far in Vermont that the state has now put obstacles in’its way. At first glance all this looks as though we were being colonized by foreigners. Is it really our fate to recapitulate Brazil’s experience? The significant difference between Brazil and the U.S. is that foreigners invest their own currency in Brazil and take their interest out in their own currency, while their investments and returns in the United States are in United States currency. Foreigners can do with their income from U.S. investments what they do with their interest from U.S. bonds, and the consequences for us are the same. Foreign investment is not bad per se. To the extent that it provides jobs, it is good. To the extent that it produces goods for use in the producing country, it can be good. But to the extent that it is extractive, it is bad (see “The Wages of Exploitation,” NL, August 8-22, 1983). 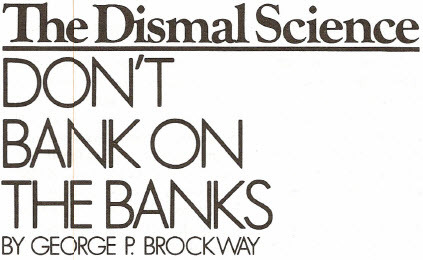 BRAZIL and the rest of the Third World are choking to death on the rich loans we have fed them because their societies cannot now digest the kinds of investments we have urged on them (see “Starving All the Way from the Bank,” NL, May 6-20, 1985). To dramatize the problem, consider the Democratic Republic of Madagascar, a nation of some 8.7 million souls occupying 226,658 square miles. Suppose the Gallup Poll went into Madagascar and asked the people if they would like to have an automobile. You know they would answer in one voice, “You bet!” Conservatively, there is an abstract Madagascarian demand for 3 million automobiles-enough to support a fully diversified, computerized, robotized industry. Sweden has almost the same population on only 173,665 square miles, and seems to do pretty well in the automobile business. Why shouldn’t Madagascar get cracking? We could list reasons from here to breakfast, and they would come down to one word (system) and to one fact (a system is not built in a day). The moral is this: Because of our system, international indebtedness does not have the same consequences for us (or for Sweden) as it may have for the Third World. The heart of our system is us-we the people. I don’t mean that we’re a national resource, as conservatives of good will like Milton Friedman would have it. I mean that we are the nation. We could be a better nation. More of us could participate in the pleasures, the excitements, the excellences that some have discovered or developed. The shame of the Reagan Administration is that it has, at every turn, reinforced exclusion and resisted participation. When it, too, has passed away, we’ll be left with that mountain of foreign debts. They will still be denominated in dollars and so under our control. This does not assure that we will control them wisely. If the Federal Reserve Board continues to manage the money supply instead of the interest rate (or try to), if our financial markets continue to be absorbed in takeovers and mergers, if our tax laws continue to reward speculation, then it is quite possible that our foreign debts will drain the enterprise out of our system. Britain is only the shell of her former greatness. It could happen here. But the danger is not in our stars, nor is it in indebtedness as such.